James Pastoriza designed several circuits at Philbrick. After leaving Philbrick in the early sixties, he founded Pastoriza Electronics, which specialized in Analog-to-Digital converters. One famous converter from his product line was the ADC-12U, which converted 12bits from an Analog input voltage to an output digital code in 10us. In 1969, Analog Devices bought out Pastoriza Electronics and started it's march to dominate the ADC industry. This reference material was extracted from a chapter about ADC history at the Analog Devices site. James (Pasty) Pastoriza, formerly with Philbrick, was a very good friend and fraternity brother of mine at MIT in the 1940s. 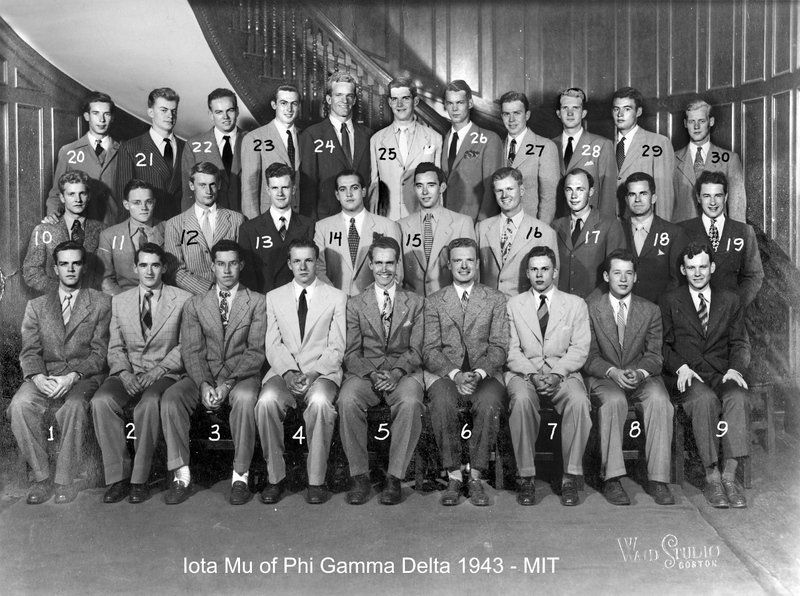 Here he is in a group photo of the Iota Mu chapter of the Phi Gamma Delta fraternity at MIT. Jim is #4. His son now resides in the San Francisco area. Those missing are myself and several others enrolled in the Navy V-12 at MIT. Gosh, I never would have recognized him [Pastoriza]. During the time I knew him (ca 1960 onward) he seemed much older, perhaps because he had lost all his hair. But then I probably wouldn't have recognized myself in a class (WPI '48) photo if I had not met myself until 1960. Sorry--I left out an important detail: The perhaps gifted company (we'll call it Electronic Prototypes) had a room that was George Philbrick's hideaway lab. Jim Pastoriza had worked for the Air Force Cambridge Research Lab. and was a customer of Electronic Prototypes. That's probably how he and George Phibrick met, and became good friends. Hence the "drinking buddy" comment. The last time I saw Pasty was on a business trip to Boston in the 1960s. We took a long walk around the Fenway andhad a great conversation. He was a brilliant guy, kept close to himself, and could be somewhat abrupt on occasion. I don't know how he died, but it was much too soon. Some years ago, I tracked his son to San Francisco. I believe he is now in ethesda. How and where and for how long did you know him? I knew him peripherally as a drinking buddy of George Philbrick during the '60s. The rumor was that George actually gave him the company that became Pastoriza Electronics. George got to own that company because he had to bail out the owner so many times from debt (they did really good work, building a lot of the Philbrick products, so he needed to protect the property and employees), that the IOUs amounted to ownership. But he gave it to Jim because he didn't want to own another company! I wonder if it's true. In January, 1969, I joined Analog Devices, and fortuitously they were acquiring Pastoriza Electronics at about the same time (PE was one of just a couple of modular converter manufacturers; it was the very beginning of he low-cost modular converter era, and Pastoriza was our key to entry. So for the next year or two I got to know Jim, and he was just about as you described him. When he heard that my wife played the piano, he became interested in possibly playing violin-and-piano duets (he played the violin in a chamber group), and actually lent her some music to look atbut nothing ever came of it. He invented a seminal monolithic quad switch that gave us an immediate technological advantage. After that, he "retired" (with the proceeds from selling his company), and I saw no more of him. A few years later I was saddened to hear that he had died of cancertoo young! He was about my age, but I've somehow survived to my 80s. Thank you very much for the historical sketch of Jim Pastoriza's role in post WWII electronics. As I recall, I was rather surprised that he had retired so soon after his creation of Pastoriza Electronics. Your explanation of his owning the assets of Philbrick and those of PE, and then selling them so that he could retire makes perfect sense. I had been unaware of the possibility that "Philbrick gave him the company", though I would not been too surprised if he did, knowing the kind of guys they were and the spirit of the times. I knew that Jim was brilliant, but I did not know that his talents extended to music and the violin! Have you heard him play? In the summer of 1958, I took my then recently widowed mother to the beach north of Santa Monica, CA. There was a large Gazebo-like beach bar where we relaxed and had some Tom Collinses and watched the surf and the surfers. It was a perfect sunny day. Suddenly, I caught the form of a familiar figure, some 75 yards away, doing some wild body surfing. It could be none other than Kemon! I yelled at him and he came over and joined us. Small World. I think he was here on a business trip.